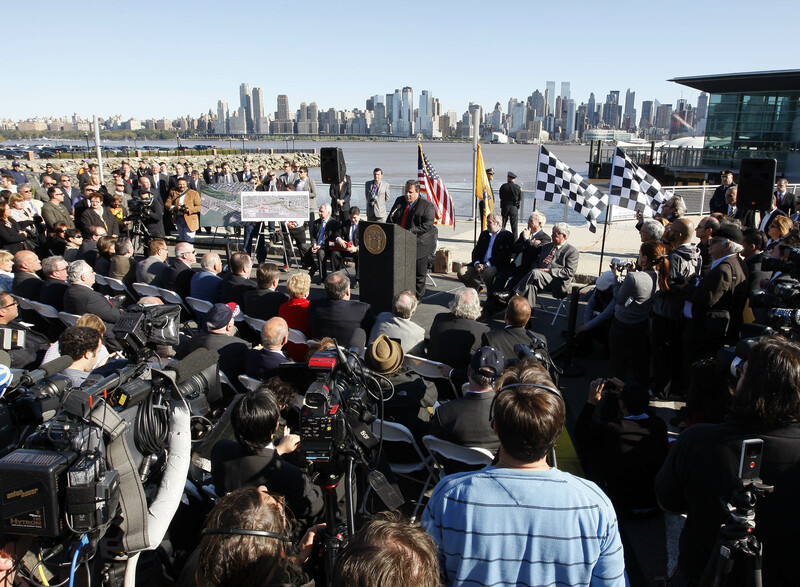 As I reported in September, it has now been confirmed that there will be a Grand Prix of America on the streets of the New Jersey communities of West New York and Weehawken in June 2013. The event will see F1 cars running with the New York City skyline as its backdrop. 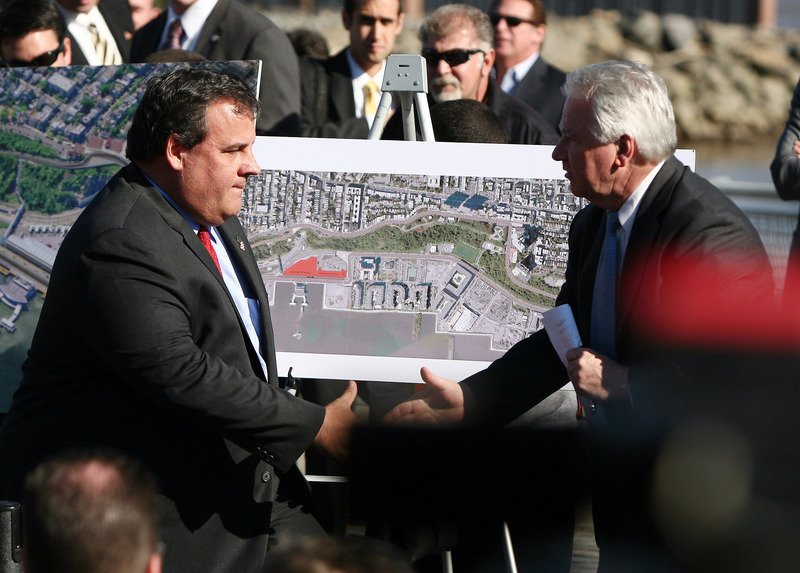 The news was announced by New Jersey Governor Chris Christie at a press conference at Port Imperial. 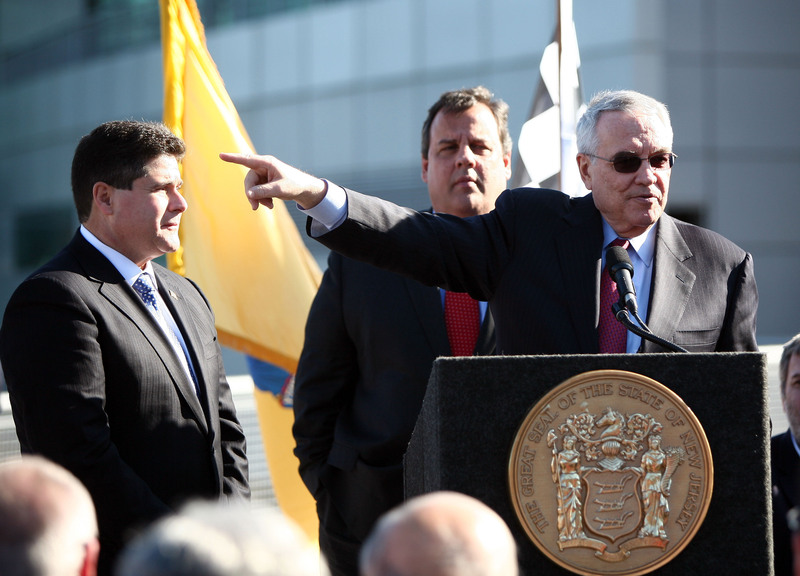 Christie said that a 10-year deal has been signed for a race on a 3.2-mile temporary circuit. Christie said the race will have a significant economic impact for New Jersey. The event will be paired with the annual event in Montreal, Canada, and will have no effect on the US Grand Prix that will be run in Austin, starting in November 2012. What the event will look like. The race promotion group is led by Leo Hindery and features Humpy Wheeler as a consultant. Wheeler is a legend in race promotion in the United States. After working as a sports writer, a television director, a real estate manager and a dirt track promoter, he became the director of racing at Firestone Rubber & Tire Co and was then hired by Bruton Smith in 1975 to run Charlotte Motor Speedway. Smith and Wheeler turned Charlotte into the centre of NASCAR and at the same time built up Speedway Motorsports, which in 1995 became the first publicly traded motor sports company. Wheeler was known as the sport’s most colorful promoter. He left Charlotte in 2008 and has since built up The Wheeler Company, a consulting management firm focusing on motorsports. Governor Chris Christie shakes hands with Weehawken Mayor Richard Turner. Ace promoter "Humpy" Wheeler, who did much to make NASCAR what it is today. Good news apart from one thing. In 2013 there will be the US Grand Prix at the Circuit of the Americas in Austin, Texas but the Grand Prix of the Americas will be in New Jersey. I will have to take the Governor at his word. “No public funds will be used to stage the race, Christie said.” I welcome the race but do not want my tax dollars lining Bernie’s pocket. Why don’t they just call it the New York Grand Prix, the New York Giants/Jets/Red Bulls all play in New Jersey. They get away with it. Awesome news. Now I just need to convince my girlfriend to quit our jobs, and take on a six month adventure of North and South America, making trips to both US Grand Prix, the Canadian Grand Prix, and then Brazil. I really like the look of this circuit. It seems so natural compared to the new circuits we see. Because it’s on real existing streets with landmarks it should be much more interesting compared to carving a circuit out in a dockyard or putting down a track on a blank parcel of land. 25% chance this ever happens. 75% Chance lots of people lose lots of money to Bernie. Remember that you live (or used to live) in the Land of Opportunity. The only thing that matters is how much FOM are charging the promoters to host the event. The higher value the less successful this event will be. In an ideal world FOM would charge nothing so the tickets could be dirt cheap but sadly we don’t live in that world. 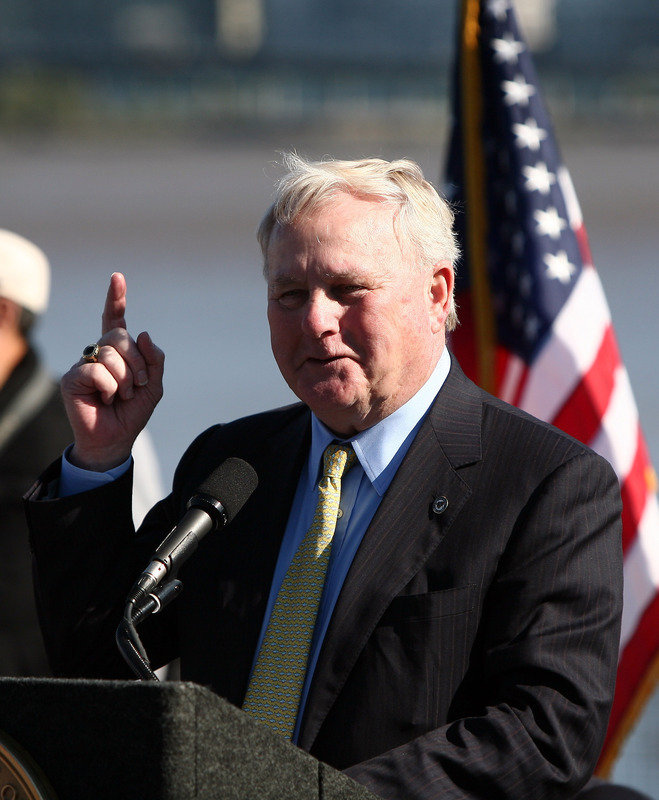 Humpy Wheeler may have a funny name but he is a wise choice. We should hope he has real influence and is more than just a rented expert for superficial credibility within American race-marketing circles. Bernie should move into that man’s offices for a year or two. It’s actually the fourth story on the WFAN website and has a whole two comments. Did Governor Christie get these figures about pumping money in the area and attendance from Phoenix? But at least the Garden State won’t have any ostrich races to compete with. He does not need to look at Phoenix, all F1 races produce this kind of money. There are plenty of studies out there. I left plenty of money in Phoenix… and never saw a single ostrich race. Brilliant! A marquee even to mark the lengthening year, and pairing it with Montreal will make for a great fortnight. The glass is not half full. It is darn near running over. The televised announcement was incredible, with Governor Christie (one of the most popular and influential politicians in this country) just loving his role as leader of a very high powered and influential group that has done much work on this project. He compared having this race to hosting the SuperBowl, and talked about a ten year commitment. The planning is very far along. The track lay-out is marvelous, especially the changes in elevation! Joe-it is suspected that you knew all along about the tremendous commitment that had quietly been made for this project. You must have had a good chuckle at all the nay-sayers who saw a half empty glass. My Cantonese Chinese friends would call you “Banju Sic Lo-Foo”. It means “The Pig who ate the Tiger” and is quite a compliment. So do you have any stock market tips for us? I have no money to play the stock market. Montreal followed by New York what a great double header! I do feel for Austin though. I doubt that many American F1 fans will support both events and international visitors are more likely to lean toward “the big apple” rather than the Austin despite the fact that Austin looks like a great circuit with better spectator access and viewing areas. The two races will strengthen one another. As a former naysayer regarding events in the NYC area, I’ll admit this looks like a credible plan and a good idea. I even like the layout of the track. Hopefully they can pull it off and I’ll see you there in 2013. And thanks for sharing your Grandprix+ article, Joe. Interesting background. IIRC, you posted once that Tony George had bought the trade mark to the name “U.S Grand Prix” from Bernie. Do you know why Austin will use the FTG ™ and Jersey apparently isn’t? on October 26, 2011 at 2:18 am | Reply J.D. One writer here in Canada was wondering what this will mean for the future of the Canadian GP. Apparently the fees paid to Bernie for Montreal are quite cheap comparatively and with the contract running out in 2014, he was wondering if it might be in its last years. Any thoughts? If Austin does work out (as well as NJ), is Montreal in trouble? It is the Grand Prix of America, no plural and no ‘the’…..not exactly confusing Will it fly? I think so if they don’t get bogged down with frivilous injunctions from tenant’s and owner’s associations trying to stop them using public roads on top of the Pallisades. It looks like quite the track at 3.2miles and that’s a hefty elevation change, it’s going to be fast too, the big question being will it allow good racing? Look at that lovely hairpin at the end of a fast straight at the north end. Well done Joe – you were way ahead of everyone else again! I hope that those who have no pit pass take note. You wait for years for a US GP and then two come along together. How typical is that? Right Joe. Which is why Phoenix, Long Beach, Detroit, Indianapolis, etc have never brought F1 back. I have heard this stuff from politicians about sporting events bringing in dollars and revitalizing neighborhoods for 40 years now, going back to Mayor Lindsay and the $24 million plan to rebuild Yankee Stadium and the neighborhood. They spent $100 million on the stadium, no neighborhood improvements happened. 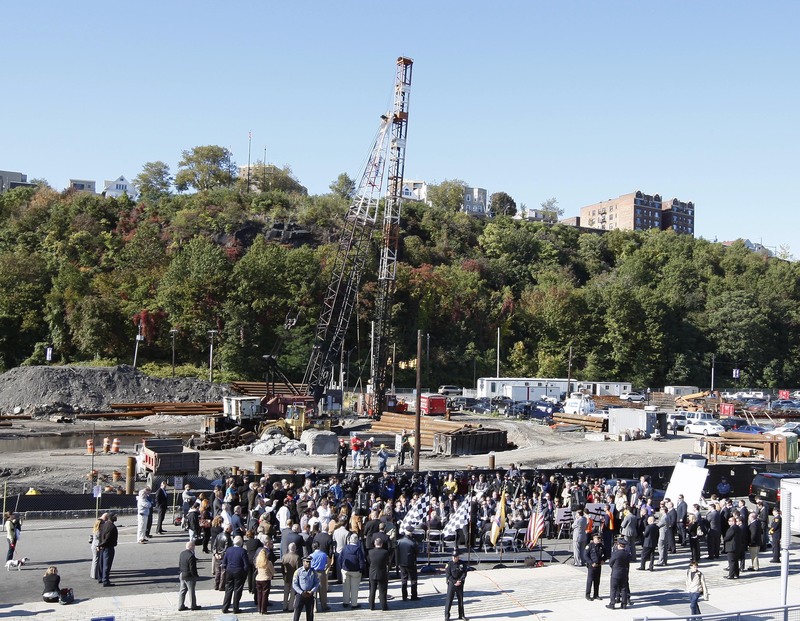 ; New Jersey still owes some $113 million on the Giants NFL stadium that is now a parking lot. Say that some things are worth doing and cost money but don’t give me the economic bonanza nonsense. Let’s hope if this race happens, that it is a good track and good rave. That seems to be scarcely mentioned. I know nothing about stadiums, but I do know a fair bit about F1. I suggest you do a little more homework and don’t rely on what you think you know. After you have read some proper research, you will understand. Look at Long Beach, Melbourne and Singapore, just for starters. All F1 races have a huge positive effect on the local economy. End of story. There is not even an argument. It even worked in Turkey, admittedly less so than in other places. Judging from the press conference pictures and virtual walk around the track on Google Street View I think the backdrop of the race shall look fantastic. The only surprise is that the track will ran counter-clockwise, for some reason I was certain it would run clockwise. > The only surprise is that the track will ran counter-clockwise, for some reason > I was certain it would run clockwise. Looks clockwise to me. What makes you think it’s not? It seems disallowed to be even slightly negative, but, it seems personally to me as though the track could be really boring – i.e. too thin, no over-taking possible, and too simple for an F1 car. A few right handed corners and a couple of long squirts to the next one. Please feel free to be as negative as you wish. A few years ago, I had managed to get my wife to agree a 2 week Canadian holiday and a trip to the Grand Prix. Alas we got pregnant and the trip never happened. But NYC? I imagine a lot of groups of couples will attend this one. Men can get on ferry and attend Grand Prix. She can spend Fri, Sat, Sun shopping and doing SITC tour. In the evening both can go to restaurants & bars together. This location is going to be the key to its success. Plus plenty of hotels in NYC NJ. Would have been quite interesting to see the annoucement. I did a bit of google street view-ing. Along the top of the cliff looking towards New York looks amazing. However looking back towards New Jersey, looks very un- formula one. With quite old looking and some cheap looking housing estates. No doubt they will do up a lot of the area around the water but looks very different to what I’m used to seeing on tv in Monaco and Singapore. > All F1 races have a huge positive effect on the local economy. > End of story. There is not even an argument. No argument about it having an impact, but I think it’s unfair to say that means “end of story”. There are reasonable arguments about whether actual impact lives up to the projections, especially since the projections always seem quite ambitious. Whether the project is beneficial depends not just on the positive impact but also on the costs. Since it boils down to cost vs. benefit, there can be very reasonable grounds for doubt about how the ledger settles. I don’t know how F1 does these things, but with stadiums over here one reliable factor which encourages doubt is that projections seem to be performed by those hired by project advocates. As a rule, opponents don’t have, and therefore don’t spend, megabucks getting a second opinion. What results is similar to the problem of Moody’s giving AAA ratings when their business depends on clients getting results they like. Without a truly independent rater, or without a client who truly has no preferences regarding the outcome, these things provide as many questions as answers. That being said, it’s all fine with me if they help get a race in NJ/NY. I don’t know of such things being used when they were not supporting momentum that was already underway. Sort of a numerical “seal of approval” to what the local powers had decided was gonna happen anyway. Wow that’s a short looking pit straight. I guess the extended section at the end of the pits with the sharp corner is to make sure making a pit stop takes a reasonably long time compared with some of the new low penalty circuits. The circuit looks like good fun, reminiscent of aspects of Melbourne and Montreal and it looks like it should be pretty damn fast with a couple of decent overtaking opportunities. The track runs clockwise. Look at the gravel traps. The turn numbering on the Tilke map (first picture) does show a clockwise layout. I’m hoping they’ll drop the dreary Valencia circuit rather than Montreal, they could schedule the races so that New York follows Montreal in the current June slot, and then Brazil follows Texas near the season end. Joe, in principle I agree that F1 benefits the economy of the place that hosts a race, the facts speak for themselves. But you have to acknowledge that facts aren’t so important if the perception is that a GP track is a white elephant and the cost of holding the race is excessive. This is the problem Melbourne has faced, for while the facts say one thing, many people believe the other, especially as the economic benefits are not always immediately tangible to the average geezer. It is important that this race generates some genuinely positive buzz and tangible benefits to the area otherwise it will be too easy to let the good things get lost in the negativity of costs, disruption, etc. etc. I think this track looks good, especially when you see the elevation change and view across to New York, but I’ll be interested to see how this (and the Texas event) are supported in terms of American people buying tickets etc. One assumes the promoters know what they’re doing, but the same assumption may have been made about Indy, Phoenix, Detroit, Dallas, etc. Fingers crossed both this and Austin pay off as races F1 fans can look forward to and as events that US consumers buy into. Perception?! What value is that in this case. The reality is clear. Just because some bureaucrat dares not put a figure on the intangible economic impact does not mean that there is no intangible impact. That’s a load of old hokum. I assume F1 have a preference that all new racetracks should run counter-clockwise; this would be to counteract the majority of clockwise F1 tracks, thus evening the G-force load on the driver physically throughout a season. Although why India decided to be clockwise I have no idea. Stephen’s link to the pits rendering gives a better idea of the elevation changes – a nice long uphill drag, though (according to Motor Trend) the elevation change is just 133 feet. Now if they built a 1900s-style hotel and a Casino at that top corner, they could start to make claims…. I agree. Also look at run-off areas. They couldn’t have a better person than Humpy. He understands racing at large, knows the market, cab think on an international basis and s very helpful. Great choice, Austin, you got a problem. firestone rubber and tire co ? when did they change the name joe ? No idea. When they wre bought by Bridgestone? I was just looking at the track on Google Street View – it looks like it was made to host a street race!! It’s going to look like Monaco. Congratulations on getting the scoop. I’d love to see the IndyCars as the support race but that’s like oil and water! Maybe ALMS or more likely GrandAm. I wonder if Bernie’s the promoter on this one. Wouldn’t surprise me in the slightest. Looks great and I’m nearby so awesome 🙂 I’ll be there of course. However, this was a bolt out of the blue for most people, including local the eco-weenies. There will be complaints about this, not only is it CAR (spit) racing, but it’s foreign car racing. > assumption may have been made about Indy, Phoenix, Detroit, Dallas, etc. Race day crowds of 185,000 to 200,000 at F1-Indy was too small? How long is the list of F1 races that outdraw that? Admittedly, attendance fell to “only” 120,000 after two doses of bad shenanigans, but do most F1 races do better than that? I’m fascinated by “as a backdrop”. My tiny brain sees trees blocking at least half the track from a view of the skyline … and surely, as with most tracks, the cameras will spend the majority of the time watching the cars rather than the skyscrapers in the distance. Singapore and Monaco only work as “exciting” backdrops because they’re racing through the streets of the city — and my memory is that the streets of New Jersey aren’t that attractive. The circuit looks great! Seems to me like a cross between Melbourne and Montreal. Can’t wait to see the cars blasting down the waterfront, with NYC glittering across the Hudson. It was a bit hard to sleep last night, thinking about that Grand Prix in New Jersey. There is little question in this sometimes skeptical old mind that this race is going to happen and on schedule. The New York media (which means the national media) will have a field day with all the personalities descending on Gotham for the race. One can expect to see great media demand for appearances by the likes of Vettel and Button and Hamilton on major TV programs. Americans will love the story of Frank Williams coming back from that terrible wreck. And one certainly hopes that Reubens is still driving in 2013-he would be wonderful on American TV interview/talk shows. Louis Hamilton generated great interest and positive coverage from his afternoon appearance of swapping rides with Tony Stewart at The Glen. One can expect that the smart and commercially aware U.S. drivers like Tony Stewart, Jeff Gordon, Danica, Dario and maybe even Junior will all be making appearances in New York that week. This is just a media “god-send” for all of racing in the States. Is it proper English language usage to say that reactions to this New Jersey F1 news can be used as a “shibboleth” to separate out the hopelessly negative from the rest of the crowd? Best wishes for a safe and productive trip to India. *Sigh*. Is it too much to ask that maps for a single event match? 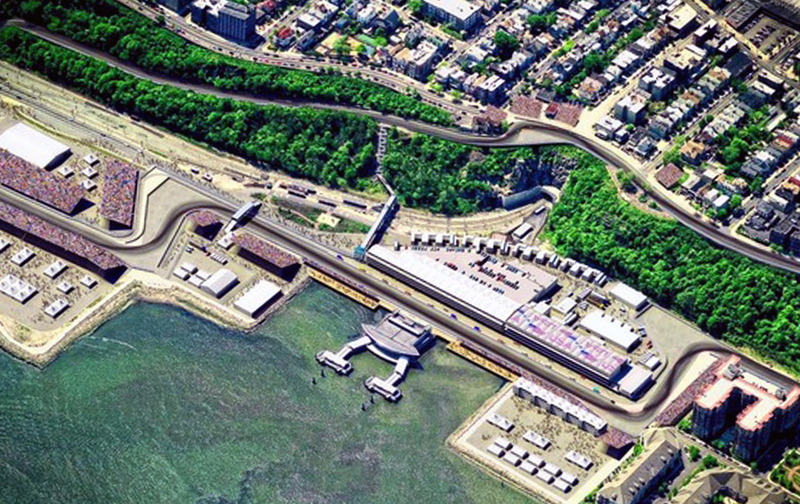 Look at the overhead map presented at the event, plus the pit rendering, then compare to Tilke’s map. There’s variation in the section of turns one, two and three with turn two being in a different location, causing variance in the degree angles of turns one and three and the location of the pit exit. A small difference, yes, and not one that should diminish from the announcement (though, has Ecclestone said anything yet? ), but for crying out loud. Assuming Tilke’s map is official – and not outdated as suggested by the words “concept design” – it just looks unprofessional having conflicting information, especially for an event trying to ‘break into’ the USA (despite holding at least one race a year there for 32 consecutive years). Going by reputation, I’d be inclined to believe it’s Tilke’s balls-up. Twit. On a unrelated note and for people’s reference, clockwise is the direction a clock’s hands move, hence the word. Anti-clockwise is the opposite (again, hence the word). I’m reminded of footage of people getting it wrong. I don’t know why I seem grumpy, but I apologise to anyone offended by it. I have to say, this is pretty exciting-there is lots of info available immediately here in this modern age. Years ago, when the race was put forward for NYC, it was tough to find out any of the details. I heard that they eventually got to the stage where they moved dirt in a city park for the track. But there was no coverage anything like this. I will be able to walk to this track! Too bad the South Koreans don’t know that. They stupidly believe they are losing about US$30 million per race and are planning to cancel the whole damn money-wasting circus! I have to give credit to the Turks – it took them a while but eventually they were able to figure out the difference between the expense and the profit. I don’t know how NJ will benefit economically if most/all of the race attendees and team members will be staying in Manhattan and thus spending their disposable incomes at their restaurants, theaters and clubs. Sounds very similar to a scam that P.T. Barnum ran, advertising a free buffalo show in NJ. People flocked to see the show to take advantage of ole’ PT. What the suckers didn’t know is he bought the ferry and made a fortune just on the fares. I have one word about this happening: PSYCHED!!! I live less than 10 minutes from the track. The area on the Jersey side of the river does not have the quantity, nor the quality of lodgings that are needed. Those that travel to the area will most likely stay in NYC. Hence, it is my guess that compared to New Jersey, the hotels, shops and restaurants of NYC stand the most to gain from this deal. 1) Texas Governor Rick Perry is running for US president in 2012. The politics of Texas, which I have mentioned previously, are a strange beast even in a time where all our politics are partisan and pretty nasty. They call it ‘pay-to-play’ in TX, meaning it’s cronyism at it’s finest (or most absurd). The money being spent on the Austin GP will forever be wielded as a weapon in the election process. 2) Chris Christy turned down the chance to run for Pres, despite widespread support among the republican party. He said he’d rather focus on New Jersey politics, and despite my personal feelings on his agenda, I can’t help but see a huge benefit to the entire area based on what I’ve learned about the plans so far. If they truly can hold the event without public funding (at least on the scale of Austin) the result could be vastly different – that is, the Texas race could fall into limbo while the NY event could prosper. In both cases, there are business and political interests playing a huge role in what will happen, as ever in F1, but the political push-and-shove in the two places is much different. It’ll be worth thinking about in the next few years…and yes, I do spend far too much time reading A)F1 news and B) political news. As ever, Joe, thanks for the reporting. Kudos on the ‘scoop’. Waterside section looks so similar to the 2nd half of the Monaco lap, swimming pool section! Joe, I love how you decided not to take the half-empty (or totally-empty) crowd seriously anymore. Keep on having fun. As a friend of mine says, “don’t ever wrestle with a pig, you’ll both get dirty and the pig will like it”. This track is fantastic news! It must be quite worrying for Austin as the international F1 travelers will be likely to pick NY for their destination if they have to choose between the two. Austin will have to rely more on the local crowd, which isn’t really what will add to the local economy. But for the NY/NJ people, this has got to be very exciting indeed. If I were into conspiracy theories, I’d say the fact that work in Austin stopped when the NY deal came near completion, is not entirely coincidental… but I do hope that both races will go ahead and be successful – Austin looks like a fantastic track, possibly the best Tilke track ever. Just took a look at the circuit lay-out, but man, the first half of the track is exactly a copy of the lay-out of the Zolder track in Belgium haha! On from the last chicane/corner up to the hairpin that is! Not to keen on them using Spa as a way to show that there track is going to be a great one. Maybe it is too early, but so far nothing has been said from the teams nor from a driver, giving their view on that what might happen. Also Sponsors seen to be very quite on this subject of a New York race. Using your knowledge and expertise Joe, any wild ideas on what type of support races they would bring to the track? No idea. I doubt anyone has even considered the problem yet. @Glen2, all the plans at this stage would be concepts. In most road design / building design projects engineers and architects usually produce with multiple concepts with minor variations to present to the client (the promoter in this case), and then the client picks what concept options they like the best. Furthermore concepts are illustrative in nature – all three of the plans you’re complaining about are literally the same thing, when referring to concept designs. Now that the contract with the right people has been signed, the promoter will probably decide which concept they like best, and instruct Tilke, or whoever the promoters engage (such as a Tilke competitor like Popolous or Apex) to proceed with the detailed design of the course, which will involve grading new sections of roads, modifications to existing roads, designing temporary and permanent buildings and grand stands, preparing layouts of electronic timing, communications and electrical reticulation, and the precise positioning of permanent and temporary barriers, and any other ancillary functions that a motor racing circuit requires. First off, I am somewhat excited for the race. I wouldn’t of picked New Jersey but hey… oh well. I won’t repeat concerns about finance and economic impact since it is a roundabout argument. I don’t know the finance package and who is paying for what. However, I do share the concerns of others. New Jersey as a state is roughly $34 billion in the hole. When the Governor of that state comes out with “We have Formula One” it will raise a few eyebrows. I know the Formula One management structure is made up of private companies. It is in their right to ask for whatever they want. However if they are asking for public entities to contribute, they will get these questions, skepticism and anger. I think at the root of this anxiety is: A lack transparency on individual government entities part; A lack of information about F1 finances; and what the real, proven, third-party verified benefits are. I’ve tried looking for such information in the past and failed to find anything. A lot of anecdotal evidence, a few scraps and nothing ever really concrete that tells the whole picture. Is there a centralized source for things such as economic impact statements and other related “benefits of Formula One” information? Does FOM even feel the need to get in this argument or is each promoter on their own for trying to justify such things? Personally, I think they are doing themselves a great disservice by being so seemingly ambiguous about such things. I love the idea of a race near NYC, however based on the run off areas I am afraid the Safety Car might lead the most laps. It looks good. I’m liking the idea so far, I think the track should produce some good racing – its quite similar to the Montreal track. Dump Valencia now and we have made a great swap! On a side note, am I the only one that would be more likely to go to a Grand Prix (any Grand Prix) that had an Ostrich race as a support race? Apart from being probably the best design for a new F1 circuit in recent years (wait, let’s say during the last 20 years), this track has got one major runoff problem which could be solved easily because there is space: look at the fast left hand kink next to the sports field. This looks too much like a Tamburello of sorts. Given the speed the cars are approaching there, they should have some runoff there on the inside of the track. RShack, I fully agree with your comments on Humpy’s abilities and background, and I can assure you he is more than just a rented expert: he is also Leo Hindery’s father-in-law. The promoter Leo Hindery, seeking to assure that they’re saving money by using ‘existing roads,’ said “There’s not a yard of dirt or a foot of asphalt that goes in…” Eh?? ! F1 cars are gonna run on that pavement as is? Seems incredible to me. I’ve generally found it painful to watch open-wheel cars run on American (and Brazilian) washboard-bumpy streets. Now then: are F1 cars, with their aerodynamic sensitivity to ride height, gonna suffer significant grip-instability from bouncing along in NJ? > that goes in…” Eh?? ! I don’t think this quote was reassurance was about saving money. It was emphasized throughout that no monies are to come from public coffers. Where reassurance seemed needed was on issues of local disruption. It seemed (to me, anyway) that this quote was reassurance that the town’s character is not being changed, as it would be by construction a conventional permanent race track. I don’t see that he was promising that road surfaces would not receive any beneficial attention. While details are lacking, during the same press conference, one of the two mayors said that the organizer’s payments to his town would allow them to undertake unspecified projects in the area. Anything that gets streets re-surfaced in will surely be welcome if they’re anything like the ones I saw in Manhattan earlier in the year. It looked like they’d been shelled. The roads are better over there, but there are speed bumps going up the hill!! > rented expert: he is also Leo Hindery’s father-in-law. ‘Learn something new every day. Thanks! Although I too am excited at the prospect of suddenly having two races in the US, I wonder how these two, “red meat” conservatives will reconcile having two extravagant (in the eyes of their constituencies) events Which will need infrastructure at the vary least and, as far as I understand it, in a worst case scenario (in Texas and possibly New Jersey), the state will be on the hook for the contract if business interests start bailing. They are the lender of last resort in Texas for sure (and likely in New Jersey as well), this is a fact, a fact that Democrats would beat both Christie and Perry over the head with in coming campaigns. The thing that concerns me most is the fact that Sports organizations in the US have a long history of making big promises to get venues built only to leave the taxpayer holding the bag. This has happened literally 30 out of 31 times in the NFL, and in good times this is fine, sports adds to the community and culture of a city, it attracts tourists and their dollars, it creates many part time minimum wadge jobs at the venue, as well as other benefits. However, I live in California, the land of federal tax revenue that fills in many states’ budget shortfalls when the Federal government redistributes tax dollars to the smaller, less fruitful states, which I think is great. After all, taxes are patriotic, and we are all in this together, and California’s economy is vastly more complicated and fruitful than other states. We do pay a Sales tax larger than any other state though so that we, as a state can have an expanded commons and public services…. New Jersey and Texas have instead cut social programs while cutting taxes that build roads and other infrastructure, like that which will be used to accommodate these massive building projects. Sure, in the end they may show a profit for the state, but when they do, are they going to repay the federal government and, in turn, states like California and New York for the money they have used for at least the last decade to balance their budgets all the while railing against taxes and social programs? It just looks like a giveaway to many people. While I will likely excitedly attend both Gran Prix should they come to fruition, I can’t help but feel like these two conservative governors would be slightly more tolerable if they stopped playing Santa while leaving the Dems. to be the grown-ups. > they’re anything like the ones I saw in Manhattan earlier in the year. > It looked like they’d been shelled. I have no news about the condition of the roads on the Jersey side of the river, but I do know that road surface problems in the mid-Atlantic states are due mainly to the weather, not civic indifference. The climate there features a large number of freeze-thaw cycles per year, which causes road surfaces to buckle much more than they do in environments either north or south*. Thus, keeping them smooth is a very, very expensive proposition, as it means very frequent resurfacing. * Excepting New Orleans, which has the same symptom from a different cause. The roads there are built on mush, so their surfaces suffer from the ground sinking down, not buckling up.
. Especially since I counted more than 60 houses, and a couple 25 story high rises. I’m wondering whether they are as gung ho as their elected officials, and this has got to be among the most residential race courses, and doubt there would be many that would have homes less than 50 feet of the track. How would these home owners/residents be accommodated during the duration of the GP/and set up? I tried to think about if this was something I wasn’t especially interested in, and how would I deal with it, or how would I feel about this whole deal?